Saudi Arabia is reported to be seeking a multi-billion dollar bank loan to shore up its finances as plunging world oil prices take their toll on the economy. But it’s not the only Gulf state in trouble; other oil producers are in a far more precarious position. Speedboats whisk tourists across the warm waters of the Gulf to former pearl fishing grounds off Bahrain’s coastline. Before the discovery of oil in the 1930s, the economy was based almost entirely on pearl exports. Bahrain’s government is keen to show off its heritage – but there’s another plan, said Noura Al Sayeh, chief architect for the new Heritage Trail. "The idea behind the whole project is also to make pearling a sustainable economy for Bahrain once again," said Sayeh. Bahrain and other Gulf states urgently need to diversify their economies. Oil has plunged from $120 a barrel in 2014 to around $40 today. The ratings agency Moody’s has downgraded its outlook for Bahrain’s economy to ‘junk’ status. It’s not alone, said Jason Tuvey of London-based analysts Capital Economics. “Oman and Bahrain are where there’s going to have to be an enormous fiscal squeeze over the next couple of years. And growth there is going to be extremely weak. On top of that there are political concerns in both countries,” said Tuvey. Oil provides around 80% of Saudi Arabia’s total income. But that revenue has halved in the past two years. The government is running a deficit of 15% and is reported to be seeking a bank loan of $8 billion. But Tuvey said it is not in imminent danger. 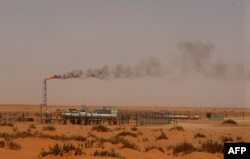 FILE - A Saudi Aramco oil installion known as "Pump 3" in the desert near the oil-rich area of Khouris, 160 km east of the Saudi capital Riyadh. “The Saudi authorities built up their buffers over the past decade while oil prices were high. They paid down debt as well. So they’re now in a position of relative strength in order to cope with low oil prices, at least compared with other producers such as Russia and Nigeria,” he said. As a member of the OPEC cartel, Saudi Arabia has the power to cut production and boost oil prices. But that could in fact undermine Saudi’s economy. “That would just entice shale producers in the U.S. to ramp up production again and threaten Saudi Arabia’s long-term position in the market,” said Tuvey. With the United States less reliant on Gulf oil – and relations between Washington and Saudi rival Iran warming – there are questions over Riyadh’s geopolitical and economic future. But last month, Saudi’s Foreign Minister Adel Al-Jubeir described the U.S. alliance as "hugely valuable." “America is our ally. It has been our historic ally for more more than seven decades. America is our largest trading partner, it's the largest investor in the kingdom of Saudi Arabia,” said Jubeir. Riyadh is trying to reform its economy by cutting wages and encouraging more private sector employment. But in a country so accustomed to oil wealth, analysts say such changes will take years to implement.